How Do In-Ground Sprinklers Work? In-ground sprinkler systems are the best and most efficient way to water your landscape without wasting valuable water. 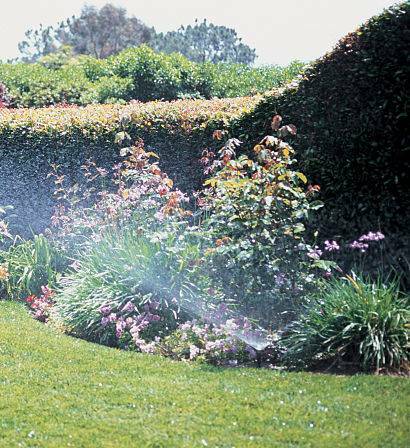 Because sprinkler heads are strategically placed and the water output is carefully timed, in-ground sprinkler systems give you the utmost control over how and when your yard is watered. While the benefits of an in-ground watering system are evident, many potential buyers wonder not why they should invest in an irrigation system, but rather how do in-ground sprinklers work? We can install the perfect watering solution! 1.) An electronic controller tells the water valves when to open and when to close. 2.) Once activated, water is pushed through the pipe and forces the sprinkler head above ground. 3.) When the water pressure stops, the head retreats back underground. So pretty simple, when the controller is activated, water is released and the sprinkler begins. But where does the water come from? In-ground sprinkler systems pull their water from one of two sources. This is the major differentiator between a pump system and a metered water system. Pump systems pump water into the sprinkler from a body of water, like a lake or a pond. This allows homeowners to service their system without taking on additional water costs. Metered water systems are usually tied to the home's existing water lines and are serviced by the local utility department. While this involves additional water costs, the service can be more reliable than a pump system. To really grasp how do in-ground sprinklers work, you must understand that everything begins and ends with the controller. The above-ground controller is attached to a set of water valves at the start of the system. This initial set of valves is where the main water source enters the system before it is distributed to the rest of the sprinklers. The controller is designed to release each valve individually, telling the valves when to open, how much water to release and when to turn off. Automatic controllers follow this process automatically, while less expensive manual controllers turn on and off with the push of a button. If you are looking to get started with a system of your own or would like more information on how do in-ground sprinklers work, give our expert team at American National Sprinkler & Lighting a call at (847) 566-0099 or schedule a free quote.